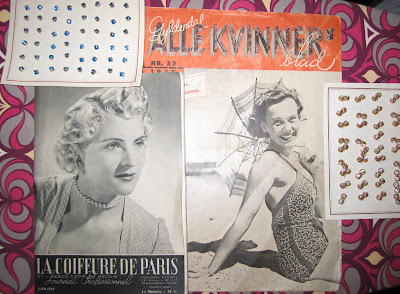 So long, long ago I blogged about hunting down my first Norwegian antique show. And then I didn't say another thing about it. Frankly, I forgot. I'm funny that way. But I did take pictures, which I just stumbled upon. So I thought, better late than never, n'est pas? The show was small. Really small. 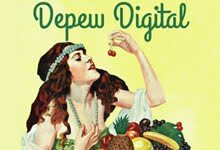 I grew up at antique shows, tucked under a display table for a whole weekend with an engrossing book, or playing dress up for my mother's customer's entertainment. This was in Denver and the shows were always on a massive scale. 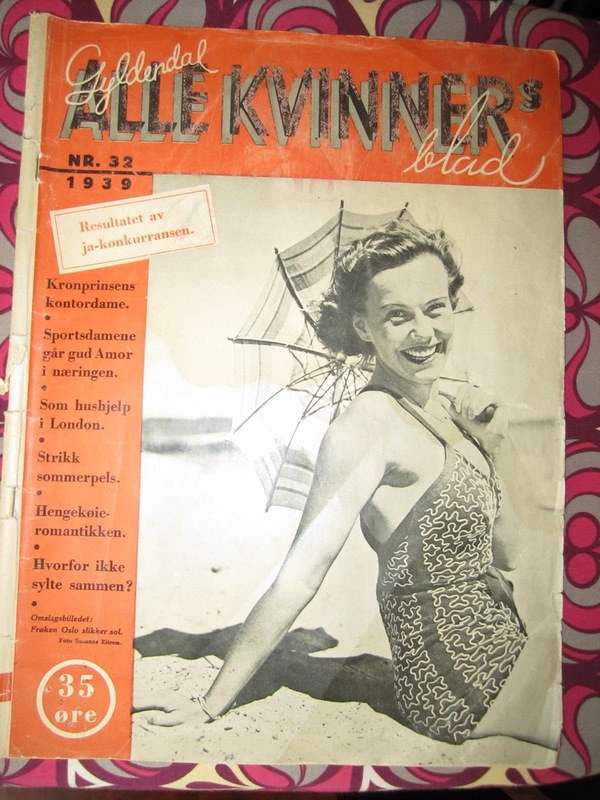 This show was advertised to be the largest gathering of antique dealers in all of Norway, Sweden and Denmark combined. Sadly, that wasn't much. The building with about 25 booths was about the size of your local small bowling alley. Regardless, I still found some cute things whilst my husband carefully examined old German pistols and training grenades. 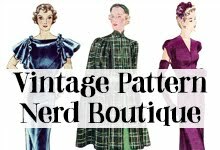 I was hunting for patterns. But what I did find was pretty great. 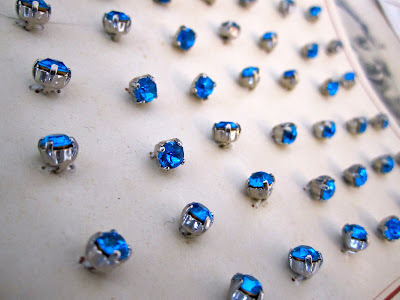 I got some lovely cards of little rhinestone buttons. There are tons of them for those lovely dresses that call for 16 or more buttons. 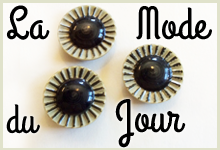 I especially love the gold double rosebud buttons. Oh, the things I can do with these. 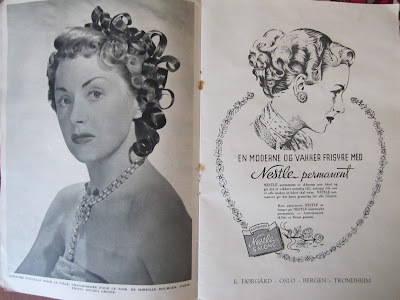 I also acquired a great "Parisian" hairstyles booklet for salons in Norway from June of 1949, with advertisements in Norwegian and French which I find an odd blend, sort of like my life. 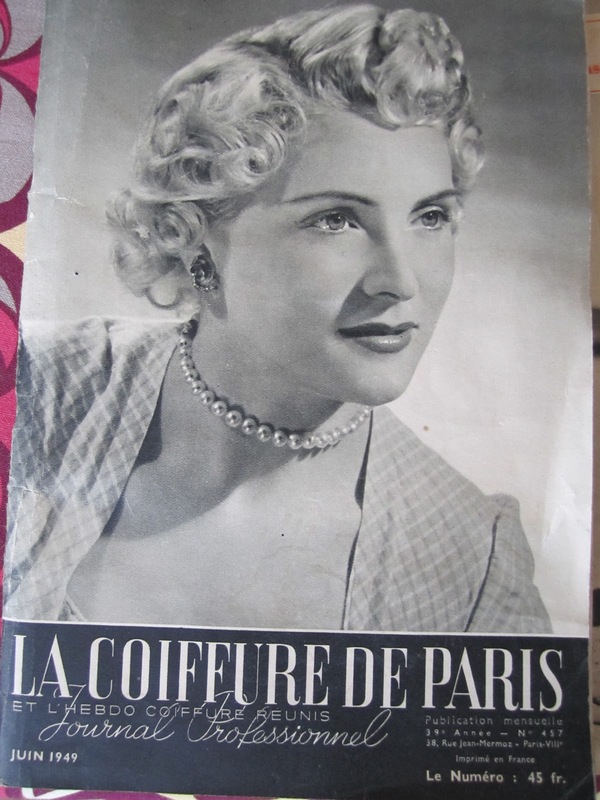 It has some charming little hair styles, and some frankly odd ones as well. 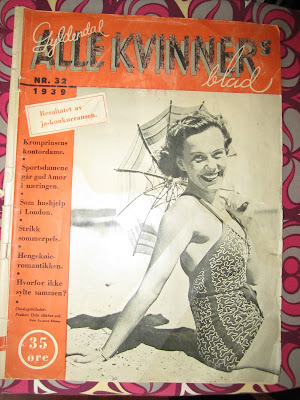 And last but not least, a great Norwegian ladies' magazine called "Alle Kvinner's Blad" from 1939 that's full of great summer styles, and a few bathing beauties as well. 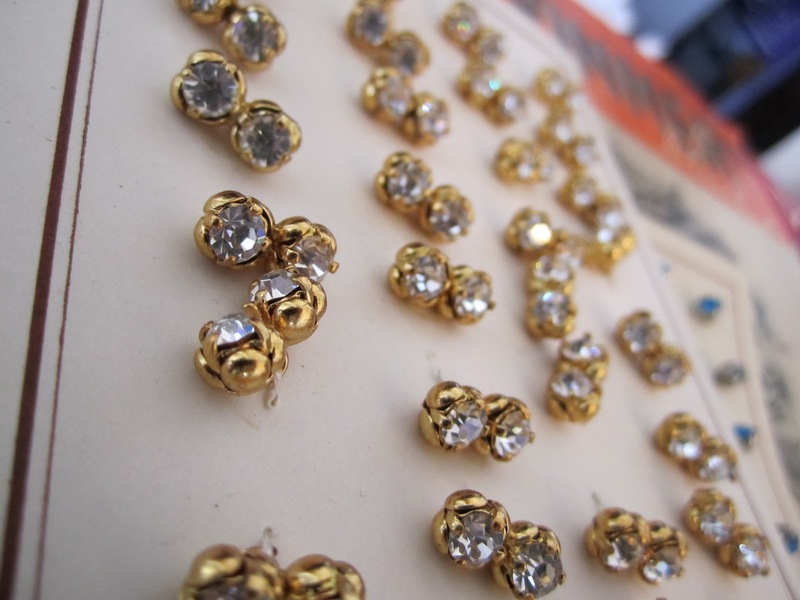 So, this is a wee bit of what the vintage hunt looks like here in Norway. I really miss the U. S. where it seems that most great finds conveniently fell into my lap without much effort. Here, I hunt, because my prey is cleverly hidden in shops that don't advertise, or tossed in recycling bins on it's way to becoming a milk carton. 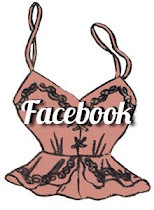 I'll do my part to save what I can from the ravages of a culture that has wholeheartedly embraced the new and seems to have tried very hard to forget the old. 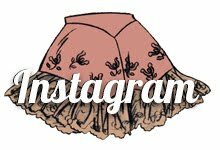 Coming soon, in the next couple of days, a giveaway, my dear friends. A very good one sponsored by a friend on etsy. 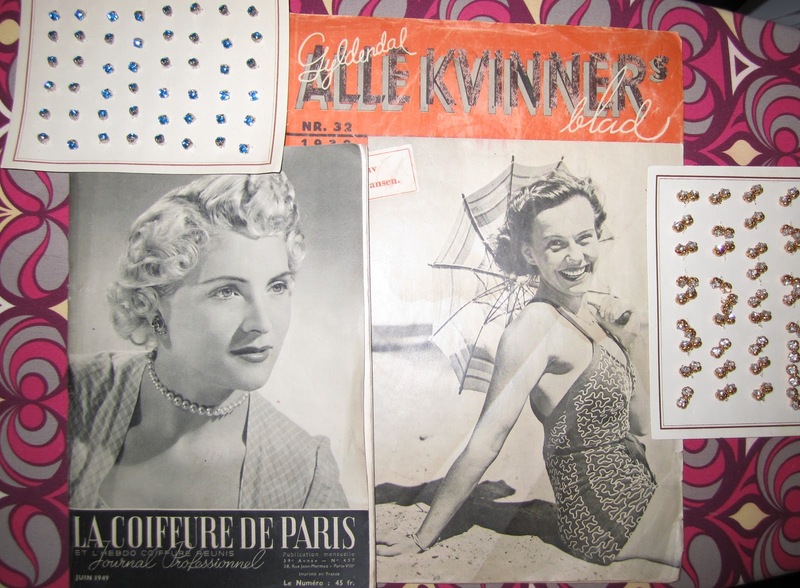 I'm Australian living in Denmark and I've got to say that I'm so jealous of your once in a lifetime find of that case full of vintage Scandinavian patterns not long ago! Finding vintage patterns here in Scandinavia is as rare as hen's teeth! 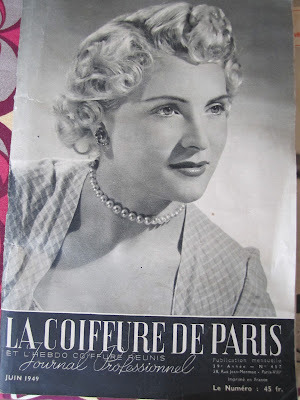 I've been to too many antique and second-hand shops, markets.. to absolutely no avail. Hi Anna, I read your blog through my RSS reader and bizarrely have just made some badges made from discontinued Norwegian Stamps (on my Etsy site - I have more photos not posted) and then I read your blog post about Norway. I'm pretty sure I got the people on them right but I just thought they were lovely stamps myself. The antique show sounds brilliant and I love the photos of the rhinestone buttons; they're really unusual. 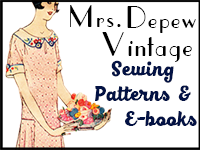 I'm quite new to sewing but your blog is giving me loads of inspiration! 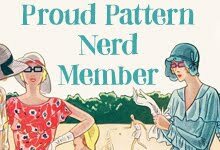 Bri, those pattern are so rare, I'm considering putting an add in all the local papers to let people know that I will buy them before they throw them away! 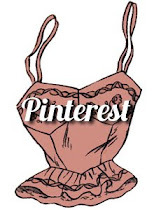 Joanne, I'm so glad that my blog can be a source of inspiration! Despite what many think, anyone can sew and it takes no special talent to speak of, just determination, and a bottle of wine!